Share Your Three Legged Dog and Cat Adventures! Sign up today for your own free Tripawds blog to start sharing the story of your three legged hero in minutes. It’s simple. It’s fast. And best of all, it’s free! If you are already a Tripawds member, simply make sure you are logged in and add a blog to your account. Or, register now and create your blog at the same time! Your blog will appear online at yourblogname.tripawds.com and it will automatically become part of our growing network of more than 1,000 Tripawds Bloggers. A Tripawds Blog is the best way to share your story, and give hope and inspawration to others who are scared and looking for help. Join Tripawds today to become part of the largest online community of three-legged pet blogs. Free membership includes full access to our discussion forums and a live chat room. Already have a WordPress or Blogger blog? Easily import existing posts and pages! Create your free account to receive an email with log-in details. Within minutes you can start writing and uploading photos. You can then add multiple users to your blog so the whole family can join the fun. Visit the Tripawds technical support discussion forum, and watch our tutorial videos for help getting started, or upgrade to a Premium account for personal assistance. We will never share your personal information and basic accounts are absolutely Free! For a nominal fee, Tripawds Supporters get extra features to make the most of their blog. Make your blog better. Become a Tripawds Supporter! Free Tripawds blog accounts include 25 MB of space for uploading photos. If you need more space, simply subscribe to be a Tripawds Supporter and take advantage of various enhanced account features. Free blogs display ads to help support the Tripawds community. Upgrade to a Supporter Blog and ads will immediately be removed! In addition, Supporters can disable ads on other Tripawds Blogs. Visit the Supporter tab in your blog dashboard for complete details about your account. Choose from three Supporter levels to show your support! Supporter subscriptions are immediately activated upon upgrade and will be automatically renewed unless you have canceled your subscription via PayPal prior to the renewal date. Cancellation will not remove your blog, only the enhanced Supporter features. Start your free Tripawds blog today! Already have a blog? Modify your account. Tripawd Blogs are just part of all this community has to offer! In addition to Jerry’s Tripawds News blog, you will find loads of helpful resources and canine cancer health tips. 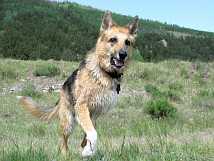 You will also find plenty of three legged dog and cat videos and lots of photo galleries that prove it’s better to hop on three legs than to limp on four. The Tripawds Live Chat is always open for members, so drop in and see who might be online! We suggest first spending some time in the Tripawd Discussion forums. Browse the topics and search for specific concerns. Or start a new topic to receive help and advice from Tripawds members. Tripawds is a user supported community, made possible only with your help! The Tripawds Foundation is a 501c3 not for profit organization established to help maintain the infrastructure for the numerous public benefit resources available at here tripawds.com. Once funded, future projects will help amputee pets and their people in as many ways as possible. If you find this site helpful, learn more about the Foundation and consider making a tax deductible contribution today! The free blogs, forums and live chat are made possible by the Tripawds Foundation. Stay informed with email updates from the Tripawds community! Receive the latest news, popular blog posts, hot forum topics, and informative articles from the archives. Unsubscribe anytime and keep a Tripawds Esty Store coupon! Subscribe to receive Tripawds News to get a free copy of Tripawd Heroes e-book and Etsy Store coupon! Hi, I am Jerry G. Dawg, and in 2006, when I was eight years old, I was diagnosed with terminal bone cancer. Doctors amputated my leg in order to give me more quality time. My pawrents, Jim and René, were emotionally devastated. They didn’t know anything about canine cancer, amputation surgery or tripod dogs, so they started blogging and making movies about my life as a way to cope. Doctors only gave me four months to live. But I didn’t care, because time means nothing to us dogs. Living for the moment is all that matters, so I decided to show my people how to really live! In June, 2007, we hit the road to travel North America in our RV. Mom and Dad drove me 30,000+ miles, inspiring people from California to Maine to Florida, by showing them how awesome three legged dogs can be. Together, we spread the word that It’s better to hop on three legs than limp on four! My pawrents and I had an incredible ride together, until October 3, 2008, when I earned my angel wings under beautiful Montana skies — almost two years past my diagnosis. Although I no longer hop on this earth, my spirit lives on forever through this website and discussion forums for three legged pets and their pawrents. 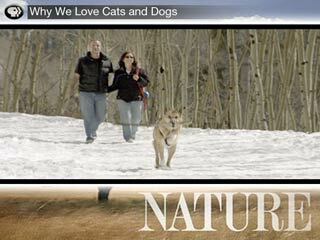 In 2009, PBS first aired the Nature episode, Why We Love Cats and Dogs. This pawesome show about the bonds people develop with their animals featured my travels with and my pack—Jim Nelson and René Agredano who founded this site after my cancer diagnosis to help others cope with the difficult decisions they faced. Read more about Jerry’s story and how Tripawds came to be! Today they continue our mission to support those facing a cancer diagnosis or amputation for their dogs and cats. They now travel with Tripawds spokespup Wyatt Ray Dawg. Now, you can help carry on the inspawrational legacy of courageous Tripawds past and present, by sharing the amazing story of your own three legged hero. Sign up for your own blog and get started today! Jerry was the Chief Fun Officer of Agreda Communications, the marketing firm founded by Jim Nelson and René Agredano. 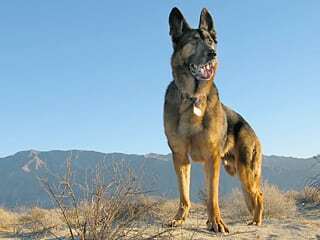 He was the original inspiration behind Tripawds, and the primary reason they sold everything they owned in 2007 to travel the country together with him in an RV, as featured in Nature: Why We Love Cats and Dogs.